We have all seen the news as of the past few days regarding the snow in Buffalo, NY. Pennsylvania and Ohio haven’t seen quite that amount of snow, but we know it could happen here, too. What they have been dealing with in Buffalo is five to six feet of snow, followed by a rapid melt. This made creeks and rivers swell extremely fast. Is your home prepared if such an event occurred a little closer to home? 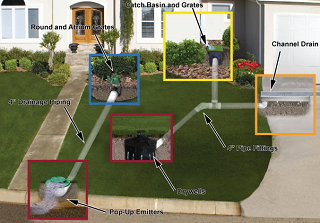 Basement drainage for your Ohio or Pennsylvania home could be your saving grace. It could protect everything you own, and help with your homeowner’s insurance. It can give you peace of mind. Snow can be beautiful, but whether it be now or in the spring, when it melts it can cause serious damage. Protect your home with waterproofing and drainage solutions from Matthews Wall Anchor & Waterproofing. We can prevent everything from a damp or humid crawl space to basement flooding. We do all of this but we also provide you with fair pricing. This is important because we remain transparent about the cost of your project. You can know ahead of time what it will cost to keep your basement or crawl space dry. We also provide free estimates so you can know the scope of your project, as well as if repair of your current waterproofing solution or replacement with a new waterproofing solution is the best choice for you and your family. We want you to be prepared for anything. We here at Matthews Wall Anchor & Waterproofing hope nothing like the snows in Buffalo, NY happen anywhere close to Pittsburgh, PA. But if they do, know you can call us anytime, and we will be there with the right waterproofing solution at the right price, right away. So, let it snow and be confident knowing you have the waterproofing and basement drainage team at Matthews Wall Anchor & Waterproofing behind you. For Pittsburgh, PA and the surrounding area, you won’t find a more experienced basement drainage team.